essica attended the Mater Foundation’s Red White and Sparkling Dinner last week. The Mater foundation helps to extend the boundaries of healthcare and medical research to over half a million Australian’s each year. The auction at the fundraiser contained a limited edition signed lithograph from Jessica, which sold for $3200. 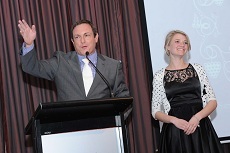 The evening raised over $50,000 for charity – a superb efort ! Thanks to Jessica’s fantastic sponsor MTA Travel for supporting the event.